Did I mention the heather (and the flies). After the majesty of the Carneddau it was time for a peak-baggers walk. This is a route that I can’t imagine anyone doing unless they were attempting to walk all the Welsh peaks. There are good views at times and few if any people to see, despite the walk being split by the Hirnant Pass that runs from Lake Vyrnwy to Bala, but much of the walk is a dreary slog across pathless heather and over nondescript peaks. The walk begins well enough with a steepish climb from the bottom of the Hirnant Pass up the side of Foel Goch. After a hard section climbing beside the woods, I emerged onto the ridge for an easy walk over the first three summits. 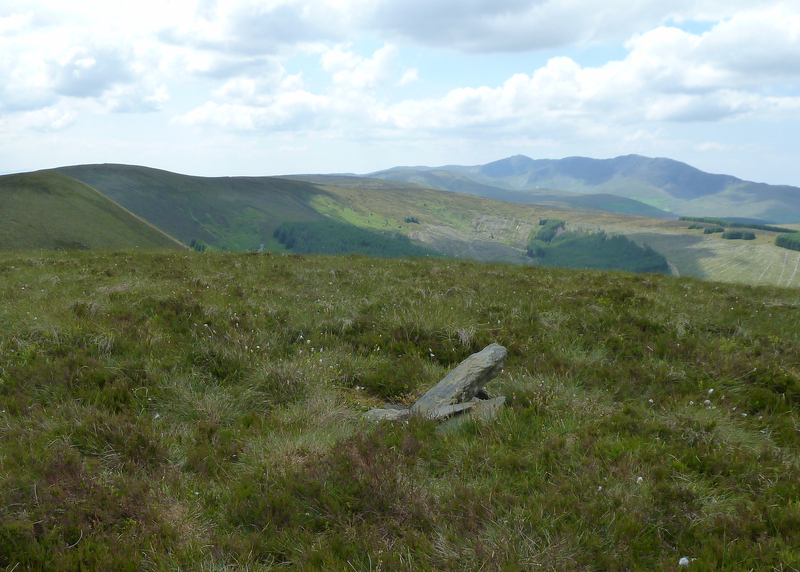 Foel Goch, with good views of the Arenigs and other mid-Wales peaks, is followed by the unmarked summit of Trum y Gwragedd and then Foel y Geifr, the highest point of the ridge. As I approached Foel y Geifr, I seemed to be adopted by the local fly population, which accompanied me on and off for much of the walk. 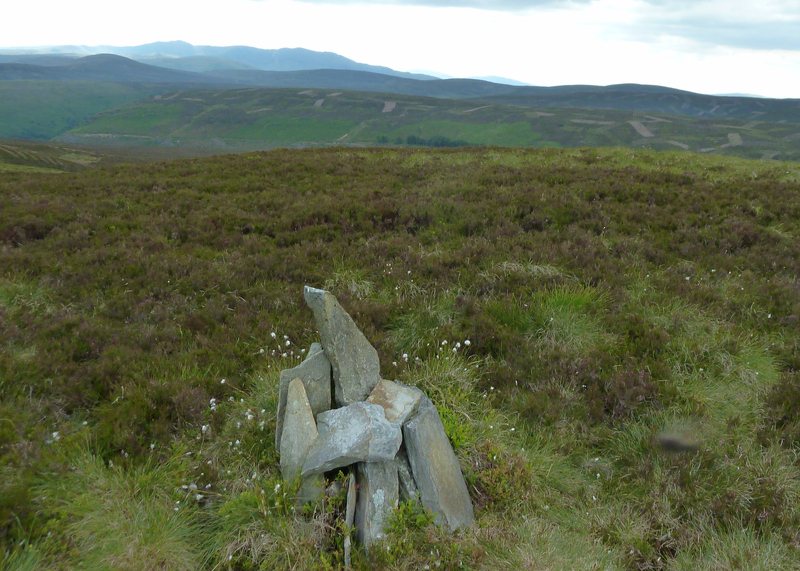 Human flesh must be in short supply on these rarely visited hills. 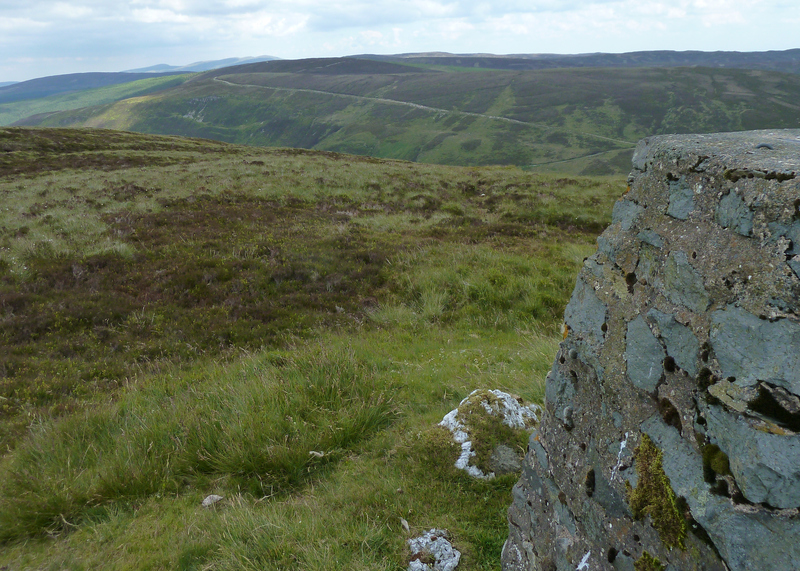 The summit is marked by a moss-encrusted trig point and there is a good view over to the Arans and the less dramatic views of the hills on the other side of the pass give an idea of the walk to come. From the peak it was a steep descent over grass and heather to Hirnant Pass. From there I took the forest road that formed the backbone for the rest of the walk. After a mile and half, a detour took me up to Pen Y Boncyn Trefeilw before returning to the forest road. The next stage however was the toughest. First I came off the road over to Stac Rhos , a plateau with an unclear summit. After walking around a bit to make sure I had reached the summit, I descended down to a boggy section before climbing again across the slopes of Cefn Gwyntog through thick heather, with only a rare sighting of any path (climbing higher to the ridge may offer a slightly better route). 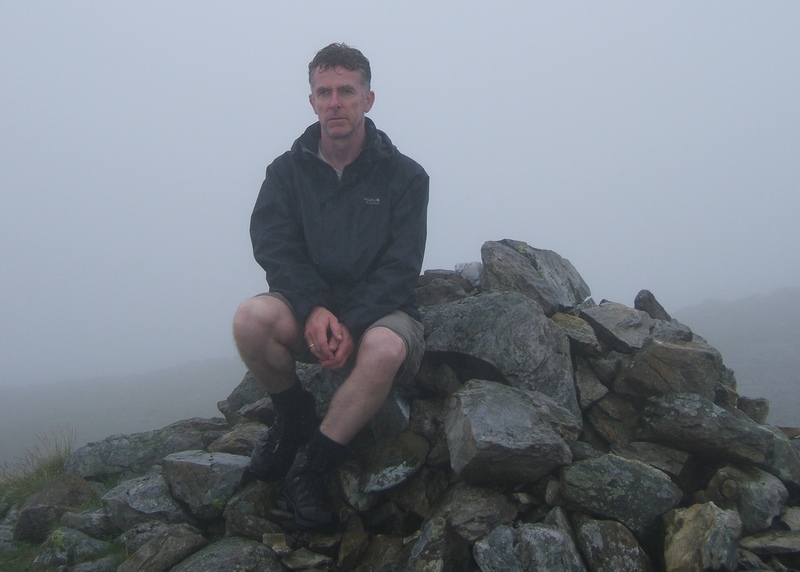 After a hard slog for half a mile or so, I reached the desolate summit. From there it was a return slog through descending through the heather to join a stream, Nant Cyrniau, that I followed up towards the summit of Cyrniau Nod. The Nuttalls suggest staying close to the stream to avoid the worst of the heather but this in turn means wading through boggy grass and marsh. The one respite came when I heard an unusual cry and saw I whitish bird circling over the moor a couple of hundred yards ahead. Larger than a kestrel and too pale for a buzzard and with a very different cry, it seemed to be circling as a warning of my presence rather than as part of a hunt. I fumbled for my monocular, and managed event ually to track the bird as it circled and then flew further away. 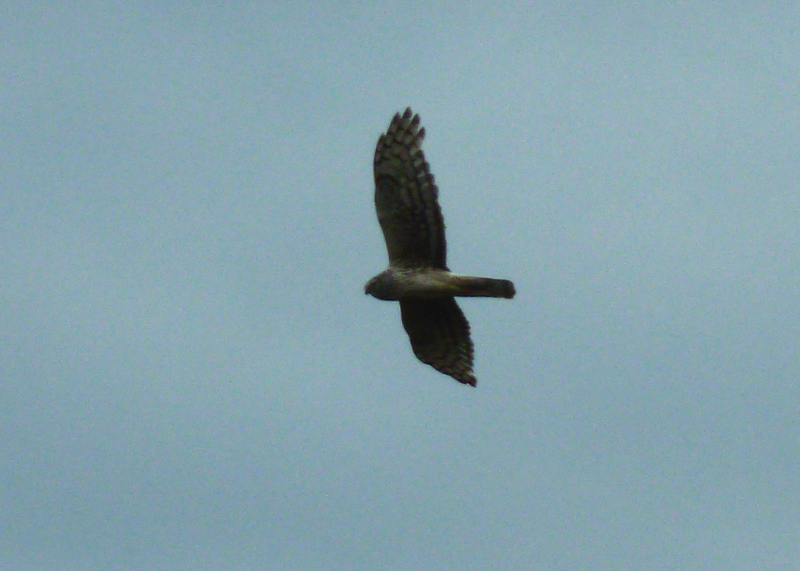 I was pretty sure it was a hen harrier but needed a longer view. Going slightly away from the stream, distracted by the bird I took the wrong direction for a few hundred yards of unnecessary heather hopping, the reward was a much closer sighting as the bird rose into the air again – circling towards me and then away for around five minutes. I’d never seen a hen harrier before – certainly not with any certainty – and the pain and frustration of the tramp through heather and bog now seemed worthwhile. It was another half mile or so of the same stuff before I reached the summit of Cyrniau Nod. There were good views of Moel Sych and Cadair Berwyn, but this felt like small reward for reaching this remote, isolated summit. From the peak it was a much easier walk alongside a ridge fence before turning off to rejoin the forest road. A short detour after a few hundred yards took me to the last peak of the day, Y Groes Fagl, and then it was steady walk through the forest for a couple of miles back to the car. This is not a walk I would recommend to anyone but on the other hand it is characteristic of the stark isolation of much of mid-Wales and with that isolation comes occasionally the chance to see something as wonderful as a hen harrier in flight. After the Carneddau, Tuesday was a r ecovery day – some gently riverside walks in Betws-y-Coed, spending too much money in walking shops and reading my book on a deep leather sofa over a couple of pints in a quiet bar. After that I was ready to test my knee on a reasonable but not too strenuous walk. Mynyndd Mawr stands in isolation opposite the Nantlle Ridge and is climbed in a straightforward ascent from the village of Rhyd-Ddu. But it’s more than just a summit to be bagged. 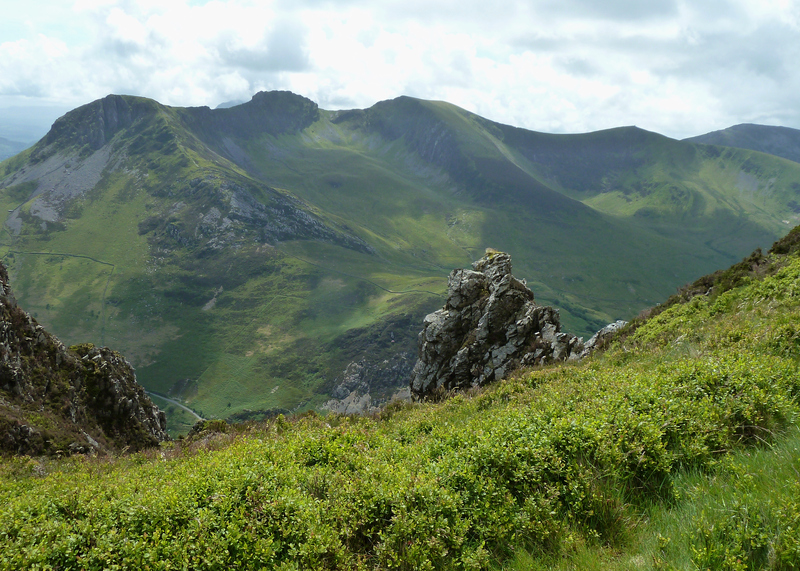 The crags of Craig y Bera looming over the dramatic pass between Ryd-Ddu and Nantlle are a tantalizing prospect and the walk provides superb views of the Nantlle ridge and across to Moel Elio and the western approach to Snowdon with Llyn Cwellyn below. It was one of those days when I was constantly putting on and off my waterproof – one minute baking in the sun, the next cooled by a brief shower and in once instance a hail storm. Generally though, visibility was excellent and I was glad I’d kept the walk until I had done the surrounding hills – being able to pick out the summits and know I’d already walked them was a real bo nus. The walk starts on a forest track from Rhyd-Ddu and then there is a steep climb up the ridge to the minor summit of Foel Rûdd. From there it’s an enjoyable stroll across the edge of Craig y Bera – with a wonderful views of the Nantlle and the pass far below – to the summit of Mynydd Mawr. After that, the only decision I had to make was whether to return the way I came or clamber down the path through a gulley that would bring me out at the other end of the woods running to Rhyd-Ddu. Caution seemed to be the best option given the twinges in my knee, so I took the same route back to Rhyd-Du and quick reward in the Cwellyn Arms. After a six month break, I finally found time for a decent spell in the hills. I’d been thinking for a while it was time to tackle the Carneddau but I was a bit concerned that an easier target would make sense after a lay off from serious walking. But I had a few days booked at the lovely Bryn Tyrch Inn near Capel Curig and a long summer’s day and a good forecast, so it seemed the perfect opportunity. The aim was to tackle Pen Yr Ole Wen, Carnedd Daffydd and Carnedd Llewellyn and possibly a few other peaks as well. Pen Yr Ole Wen looms over Llyn Ogwen and is constant presence when walking Y Garn and the Glyders. I took the more reasonable route up the east side of the hill starting from the eastern end of Llyn Ogwen. From the very start there were wonderful views of Tryfan. Last time I was here, thick mist had descended as my brother and I walked down off Tryfan via Y Foel Goch and Gallt yr Ogof to the east, now I could see our route plainly. As I climbed Pen Yr Ole Wen, the Glyders came into view along with Y Garn and Snowdon looming in the background. After a steep climb up to the east ridge there is an enjoyable bit of scrambling above Ffynnon Loer, and then a straightforward climb to the summit with fantastic views on a clear day across to Glyders with Snowdon behind. Ahead lay the ridge to Carnedd Dafydd. There had been a large party of kids starting off around same time as I did and the odd group of other walkers but I had the summit to myself for a while and time to enjoy the views. With the long hours of summer’s day ahead and a good forecast, I planned to take an easy pace on this walk. 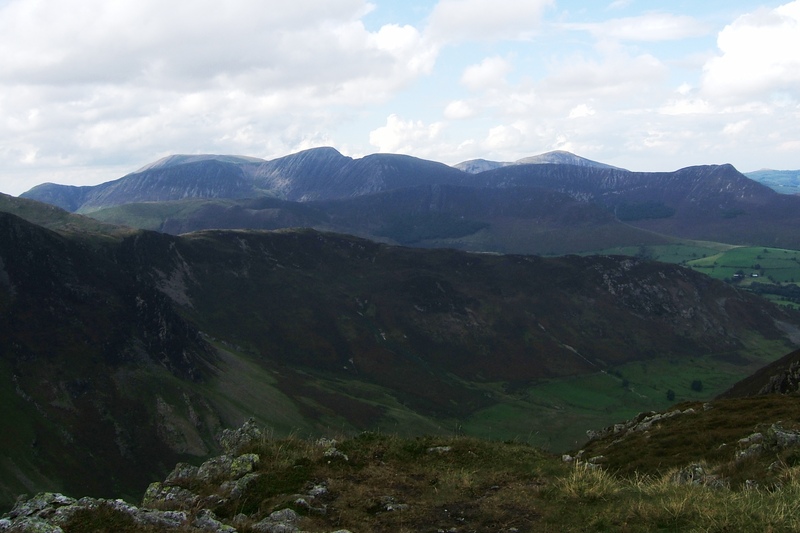 After Pen Yr Ole Wen, a wonderful ridge walk starts taking you first to Carnedd Daffydd. 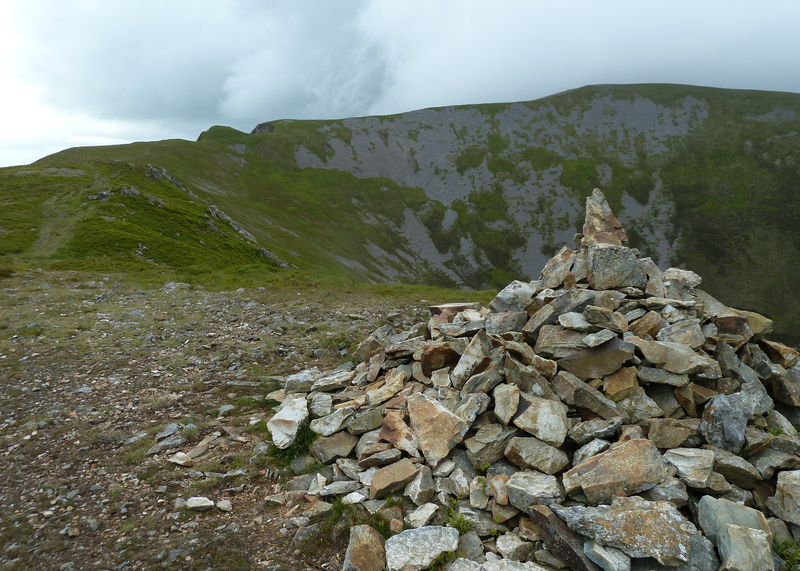 The only thing bothering me was that I knew that there was another Nuttall summit below the peak, Foel Meirch, but it would be mean descending and re-climbing 800 feet. I decided in the end that it would be too much. I wanted to make sure I did the major peaks and I didn’t trust that my knee would stand up to the extra punishment without more preparation. 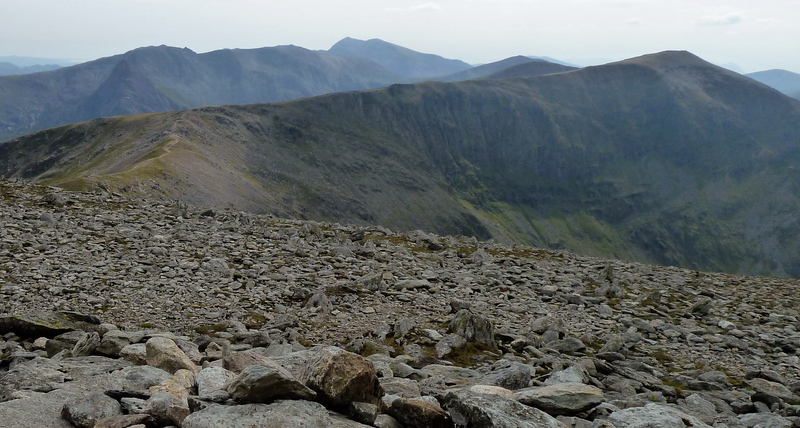 So from Carnedd Dafydd, I headed on toward Carnedd Llewellyn and Yr Helen. 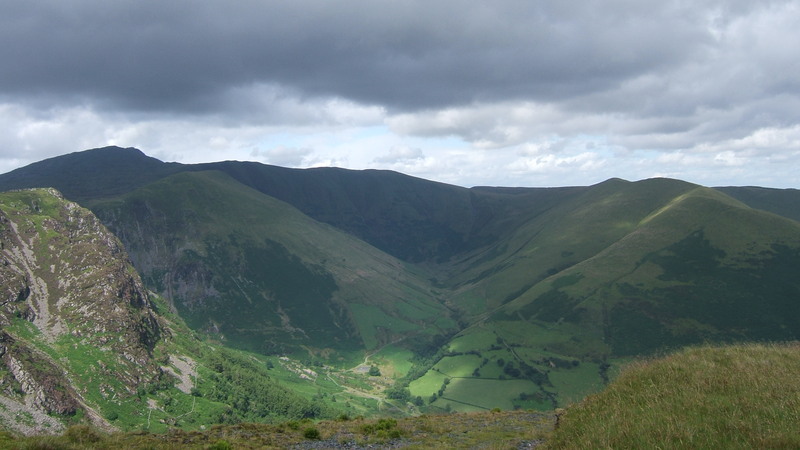 A few hundred metres along the ridge, I felt my knee twang and knew that I would be limping for much of the rest of the route , so I was glad I hadn’t wasted effort on Foel Meirch. I did decide to make a detour to Yr Helen by cutting along the slope beneath the summit of Carnedd Llewellyn. The summit of Yr Helen stands at 3,156 feet and has fine views over the coast line and was well worth the additional pain. 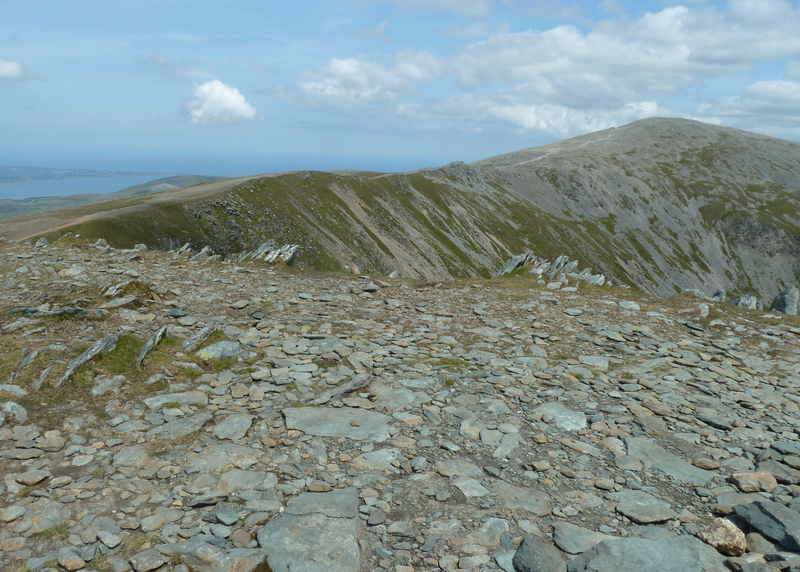 From there it was back along the rocky path to Carnedd Llewellyn, the third highest peak in Wales. The summit was empty late afternoon and I could sit looking across to Carnedd Dafydd, the Glyders, and Snowdon, with good views of the rest of the Carneddau as well. Leaving the summit I had to make one final decision. 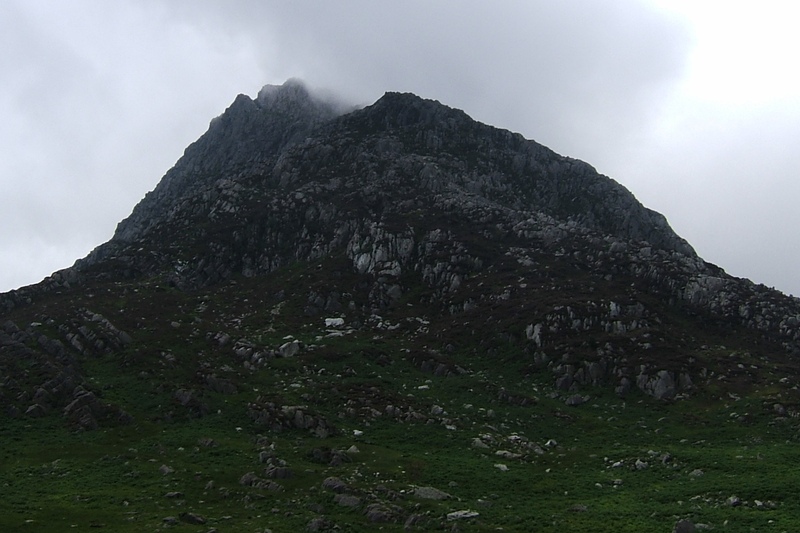 Following the Nuttall route would mean climbing up to Pen yr Helgi Du (Head of the Black Hound). I was very tempted but the nagging pain in my right knee was insistent and in the end I decided to leave that for another day. So I took the long path through the valley back to the road and then a mile or so walk to the car. Even this final section had its interest as I watched a helicopter involved in a rescue on the Heather Terrace that runs up the eastern side of Tryfan. Watching it hover close to the rocky eastern ridge of Tryfan was an incredible sight – bringing home how much the rescue teams risk in such operations. Hoping all ended well, I finally made it back to the car. Torn trousers, sun burnt legs and injured knee aside it had been fantastic day and I had covered four of Wales 3,000 foot peaks. A few pints and a good meal seemed well deserved. The main peaks of the Newlands Round dominate the view from the house we rented for the week, and so this was a must-do route. But first I had to find a way of crossing over Keskadale Beck as the footbridge below the house had been brought down in the spring floods. Safely over via some old tree roots and stepping stones, I headed across High Snab Bank to the start of the stone path leading up to the summit of Robinson. Quite steep in places, some care is needed to pick the right way through the rocks as the path fades away. Fairly soon the ground levelled out and there were fine views back down the Newland valley before the final section to the rounded peak with views over to the Buttermere ridge and beyond. 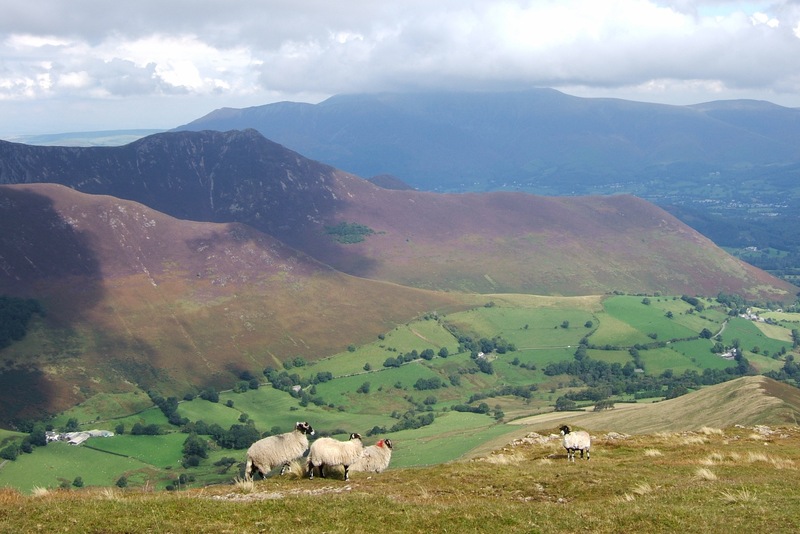 The full extent of the Newlands Round was now visible, with the path over to Hindscarth and then on to Dale Head much clearer. 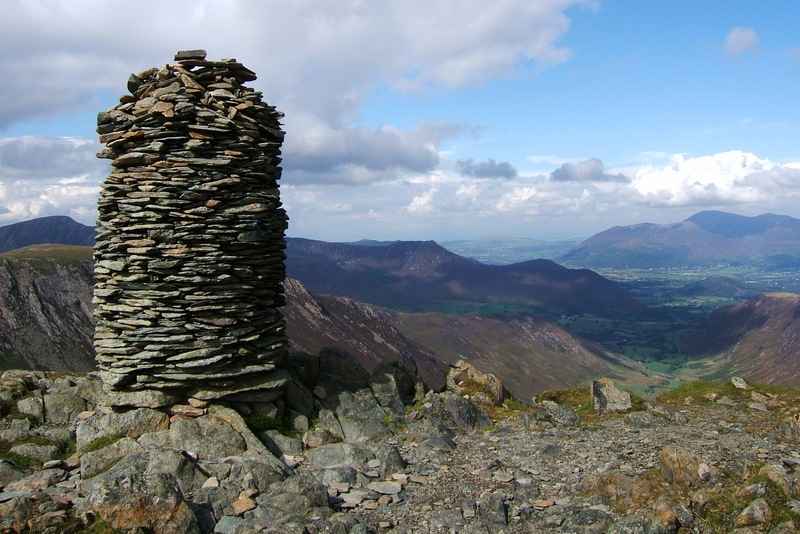 Hindscarth was a relatively gentle climb from the path descending from Robinson, with fine views from the cairn just beyond the summit taking in the whole of the Newlands valley down to Derwent Water. From Hindscarth, I returned to the path from Robinson that leads on to Dale Head. More excellent views from the summit of Dale Head, which is marked by a fine stone column. 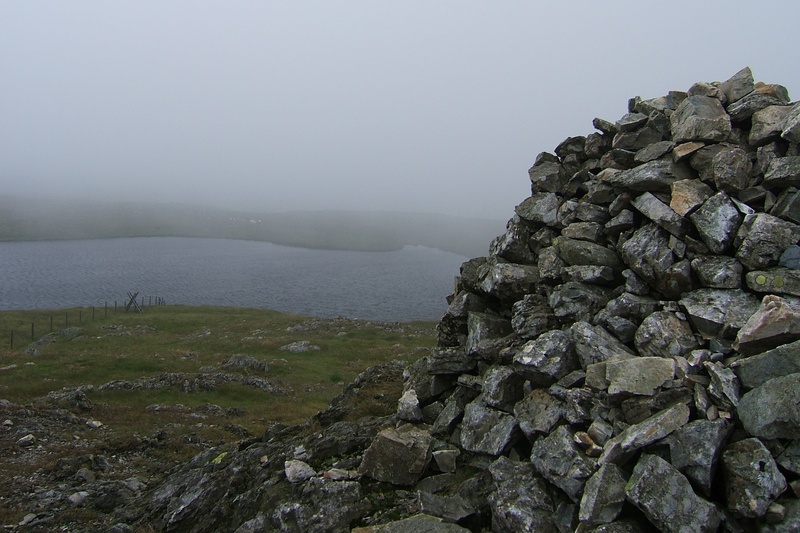 From the summit it is then a steep descent on stone steps to Dalehead Tarn. The tarn was a good place for a break and some sustenance before the climb back up to the High Spy ridge. 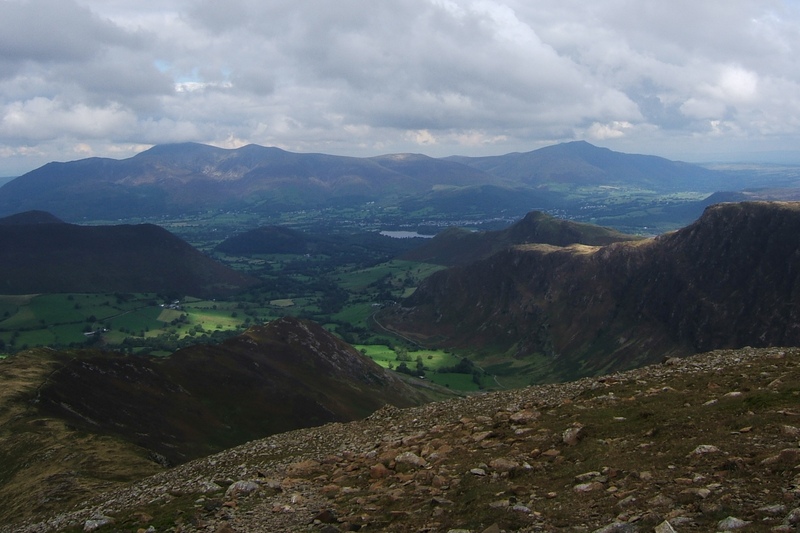 This ridge runs all the way along to Cat Bells, which I climbed a few years ago, and the shores of Derwent Water. There were more walkers now, coming up from Cat Bells presumably and a slight shower as I reached the second of the High Spy summits. It didn’t last long though and it was a pleasant stroll along the ride to Maiden Moor before cutting across to the Newlands Valley at the col before Cat Bells. From the col there was also a distant view of the house, a pleasing prospect at this point. The path home was straightforward – particularly as I avoided what should have been a shortcut via Newlands Church, deciding that the simpler way along the road to the house was bett er for my aching legs. On a fair day like this the Newlands round is a lovely challenge – not too tough but hard enough to give you a real sense of achievement. A birthday walk above Buttermere. The night before the weather forecaster had explicitly warned that this was a day to avoid the mountains, but though the wind was strong it was still clear and it turned out to be a fine day for a walk. 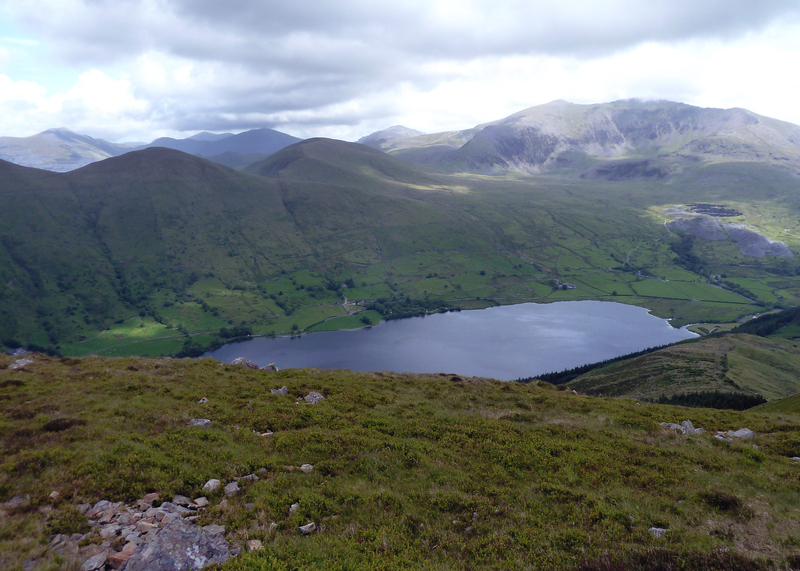 I started from Buttermere with a walk around the lake then took the path up Scarth Gap. I cut off to follow the Nuttall route where a wall cuts across the path. Then according to the route I followed the remains of another wall parallel with the ridge but I missed ‘the easily identified path’ through the scree and ended up doing a fairly tricky and unnecessary scramble over scree and heather before meeting the path near the ridge. From there it was a straightforward walk up to the summit of High Crag with excellent views across the lake and across to Great Gable. The sky was clear but the wind was very strong and I made sure to keep well away from the cliff edges. From High Crag the path is followed easily to the next peak, High Stile. After that came the most exposed section to the wind and at the summit of Red Pike I just about kept the camera still long enough for a couple of photos. Then in my haste to get away from the wind I took the wrong path of the summit, This was a short but steep and crumbling path to the ridge path below and I didn’t stop to check I was going the right way until I was already off the summit. 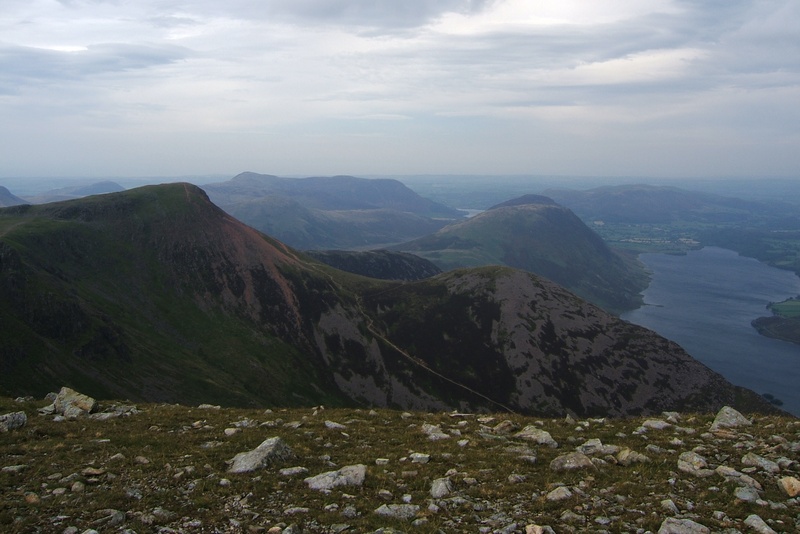 I rechecked the map but really no choice but to retrace my steps to the summit of Red Pike. It was only a few hundred metres but there is something particularly dispiriting about having to do an unnecessary climb back uphill because of a silly mistake. Once that was done, the right route was clear – a crumbling and steep scree path that I slid down as much as I walked. When it levelled out, it was an easy walk to the summit of Dodd, a quick photograph in the strong wind, and then on down to Bleaberry Tarn, lying beneath the ridge. After that it was steep set of rock steps down to the shore of the Buttermere and a welcome pint in The Fish Inn. So despite the forecast, it turned out to be a good walk with excellent views and a few lessons learnt about the consequences of making a hasty choice of the wrong path. With its knife edge perspective and gothic trio of peaks, Tryfan is an iconic Welsh mountain, holding the eye of anyone driving along the A5 near Llyn Ogwen. You can even see from the road the narrow path along the eastern flank called the Heather Terrace that was our route to the summit. I was with my brother and we started off in sunglasses, shorts and coated in sun protector. Our optimism about the weather lasted until we reached the start of the Heather Terrace, when the mist started to thicken over the summit. We took a rather circuitous route up the heather to join the Heather Terrace – being a bit over-cautious about not missing it and taking the harder north ridge scramble. But once on the track, it’s a gradual climb and clear route and only occasionally does it feel like you are on a narrow ledge a thousand feet above the valley. 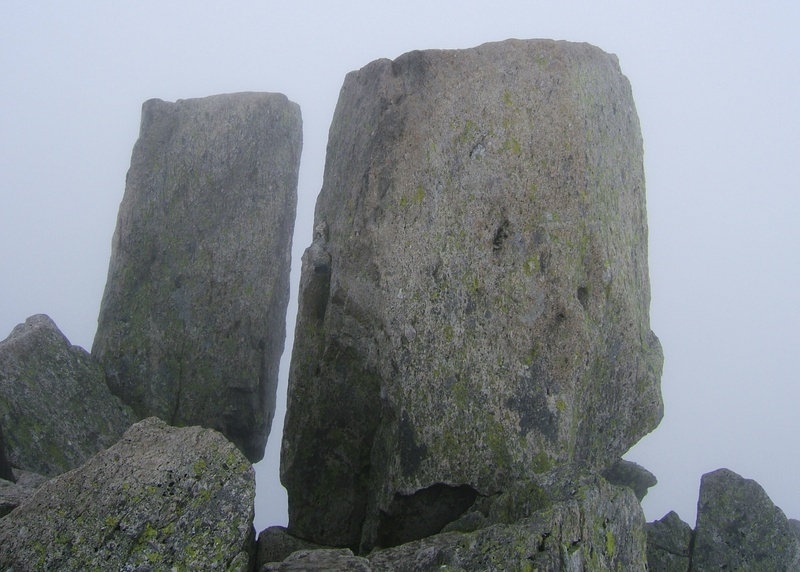 We climbed the terrace in clear conditions, with good views of the eastern Carneddau on the other side of the A5. We also passed several groups of climbers tackling the cliffs rising above into the mist and the summit. At the end of the track, we reached the stone wall running across the pass below the south ridge of Tryfan. The weather changed starkly now, on the other side of the wall the mist was thicker and the wind stronger and colder. The mist was also starting to pass to the east covering the track we had taken up the hill. With visib ility down to no more than 20 metres if that we decided to wait and see if things got any clearer before tackling the summit. 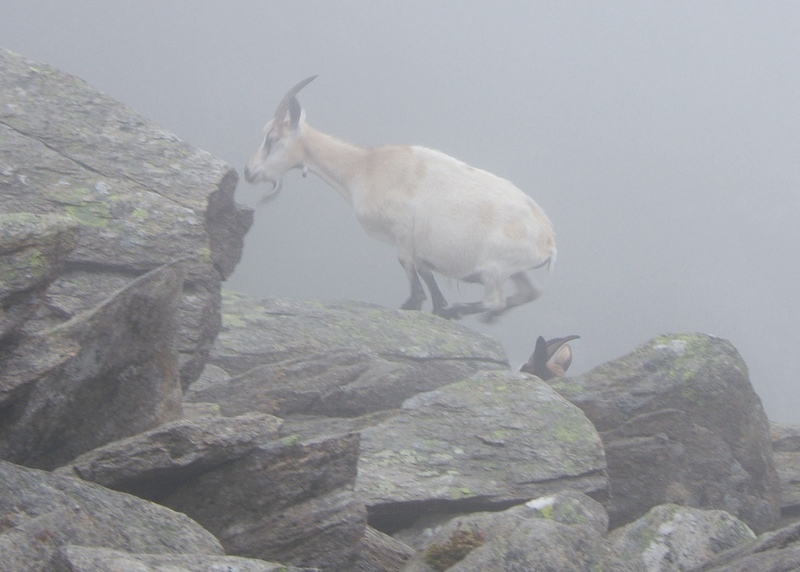 As we sat talking we heard some scrambling in the rocks behind us, expecting to see other walkers or some sheep we turned to see a herd of wild goats. This was the first time I’d actually seen them on the hills in Snowdonia, and it was a pleasant distraction watching them grazing below us before clambering over the rocks and away. After about 20 minutes, with little change in the weather, we decided to move on having spoken to a group of walkers coming off the summit who indicated the path and suggested we ‘just follow the crampon marks”. I’m not sure if this is advice to take too literally but as we scrambled over the rocks towards the summits, the scratches made by crampons did give some reassurance we were going in the right direction. As we neared the summit, we watched some walkers clambering down on their bottoms over what looked like a more difficult section. This was the ‘technically difficult’ or tricky section that some of the books warn about. In fact, it’s a short section that need a bit more attention as y ou manoeuvre over the gap between the rocks. The real challenge is not being too conscious of the large drop to your right as you make your move. Once over this, the summit was straight ahead with its famous Adam and Eve monoliths. The tradition of jumping from one to the other had to be honoured in the breach. I think I would have done it if my frozen shoulder hadn’t prevented my clambering up – but that may be wishful thinking. Anyway, it’s saved for another time, along with the north ridge path. There were no views of course, but as we had had such good views of Tryfan on previous walks in The Glyders we couldn’t complain too much. From the summit we made our way back down the Bwlch Tryfan that runs between Tryfan and The Glyders. From here we followed the miner’s track to the ridge the leads up to Glyder Fach, but this time we went east towards Y Foel Goch. With thick mist all around we were relying on compass and GPS and making sure we kept well away from the cliff edges. The walking was now over track and bog and without the mist and rain would have been a pleasant stroll after the scrambling on Tryfan. This would have been just one more misty summit, except it was also my 100th Welsh mountain summit (Nuttall) so it was a little bit special. It was probably fitting that it was a fairly obscure top surrounded by mist with nothing much visible beyond the summit. 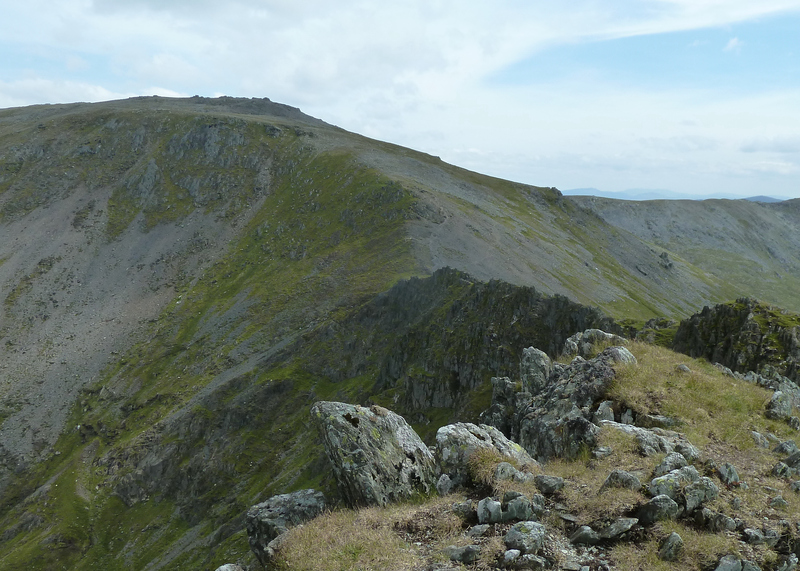 Moving on, we used compass and GPS again to reorient ourselves on the featureless and shrouded moor and – aware of the ridge edge nearby – headed north east toward Gallt yr Ogof, the final peak of the day. From another misty summit, we began the slow ascent to Cwm Gwern Gof, picking our way between rocks, bog, heather and winberry. This was slow going in the mist and not much fun. I slipped at one point and badly scraped my calf against a rock; T slipped a few times as well. But eventually, with sodden boots, we made it down to the valley and an easy but tired walk along the road to the car. After drying off, we just made it to the Bryn Tyrch Inn for the last food order and a well earned pint. It was one of those days with the walking and the achievement of the walking are their own reward and as such a good way to reach the 100 mark. It was good to be back on the hills after three months away while working on a new report. This was a good reintroduction, nothing spectacular or very hard but enough of a stretch to get the stiffness out of my legs and cobwebs out my head It also got me refocused on the goal of walking all the Welsh mountains. This is far from just a tick-list exercise though, even if the grander walks on the other Arans have a stronger pull. It also gave me another chance to take the path beside the waterfalls at the head of Cwm Cywarch. I had done this on the descent from the Aran Fawddwy horseshoe but it was late that day and I was tired and wet and didn’t really have chance to appreciate it. 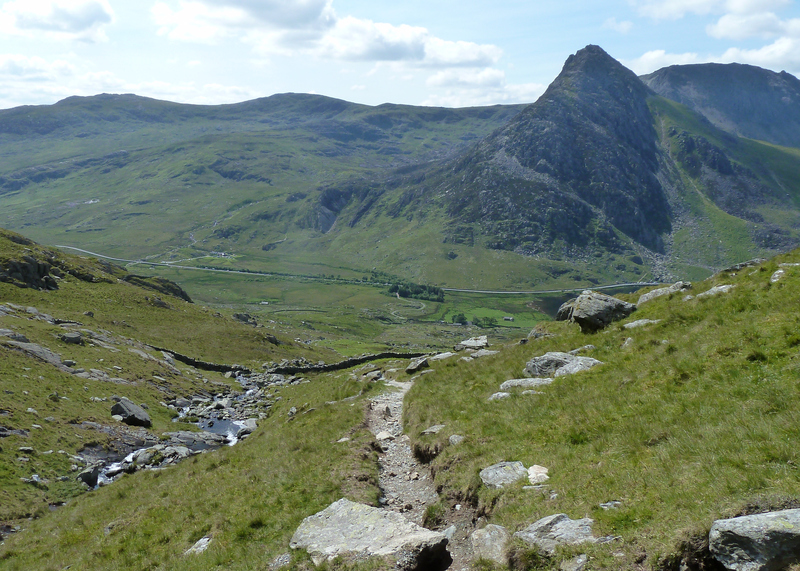 This time starting from the Cwm Cywarch car pack I walked up the valley first – with fresh legs and sharper senses. The path meanders up between rocks and streams and a series of small waterfalls, which had a fair amount of volume after a week of rain. To the left are the impressive cliffs of Craig Cywarch and across from the valley are the steep slopes of Pen yr Allt Uchaf, which I painfully walked straight up on my last trip. As the ground levels out into the boggy area around a small lake, the paths diverge. To the right is the path to Aran Fawddwy, but this time I passed the lake and went left up the hillside to reach the summit of Glasgwm. On the way to the summit, I could see back to Aran Fawddwy, shrouded in mist, and north to the Arenigs, which were still visible. Heavy cloud was moving in though, and when I reach the summit I was in the thick of it. I was just able to see Llyn y Fign, the moorland lake that lies just below the summit. As I sat eating my sandwich, I thought about how nervous I would have been a couple of years ago finding myself on the hills with mist all around. Now I was confident of the route and my experience and knew there would be little problem (and I wasn’t that surprised when I did get a little lost later on!). Heading off from Glasgwm, I wavered for a minute to check which way to go around the lake and then followed the fence to the right and then as it bends to skirt the forest ahead. As the mist had cleared now, I cut across the moor to the corner of the forest, then on to the summit of Pen Y Bryn-Fforchog – which apparently means Top of the Forked Hill. It was mu ch clearer now, hot even at times with the sun finally breaking through the cloud. Wheatears and other moorland LBTs (little brown things) were all around – and of course there was a raven waiting as I reached the summit. It’s a nondescript peak but there are decent views to Maesglaes and Waun-Oer and beyond them Cadair Idris. The next stage was always likely to be the trickiest. Following the Nuttalls route, I was aiming for a cut through the forest to join the forest track but a large area of woodland had been cut down and the path wasn,t clear, if it still existed. 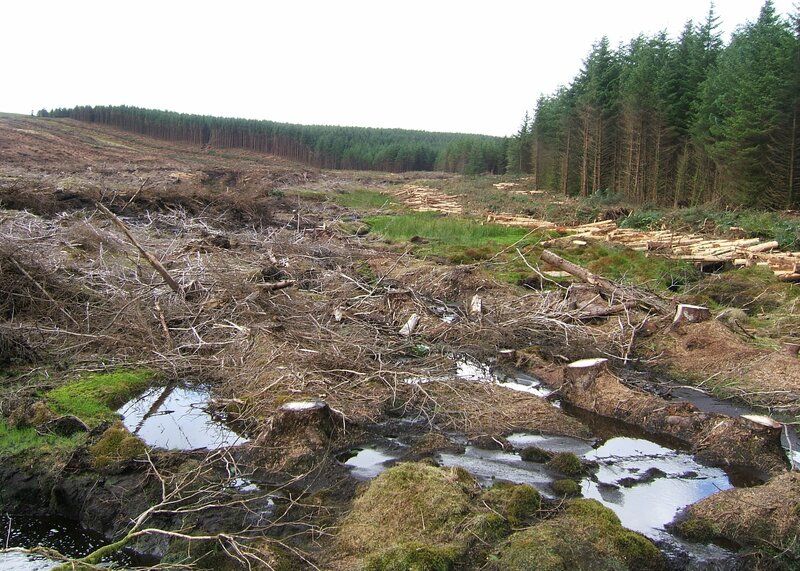 So I headed off across a desolate landscape of stumps, logs, branches, mossy hummocks, bog and streams. I could see diggers parked at the start of a track and that was my rough goal. This was strange walking – bouncing across the firmer ground around the stumps and then working my way across beds of pine branches and boggy patches. I’m reading the collected JG Ballard short stories at the moment and this felt very familiar; a post-apocalypse world with the remnants of destroyed forest all around. Eventually I joined the forest track and seemed reasonably close to where I should be. I followed this for a while but was always wary in case the path had been changed. When it started to wind down the hill side it looked like I was heading back in the direction of Dinas Mawddwy rather than to Cwm Cywarch. I backtracked a bit and found the faint path at the forest gate that the Nuttalls mention. I took this, passed over a stile and then joined the steep but clear zigzag path down back to valley bottom and the car park. All round a good mix of views and effort and a bit of a navigational refresh – and the sun was shining as I finished. Not a bad day. 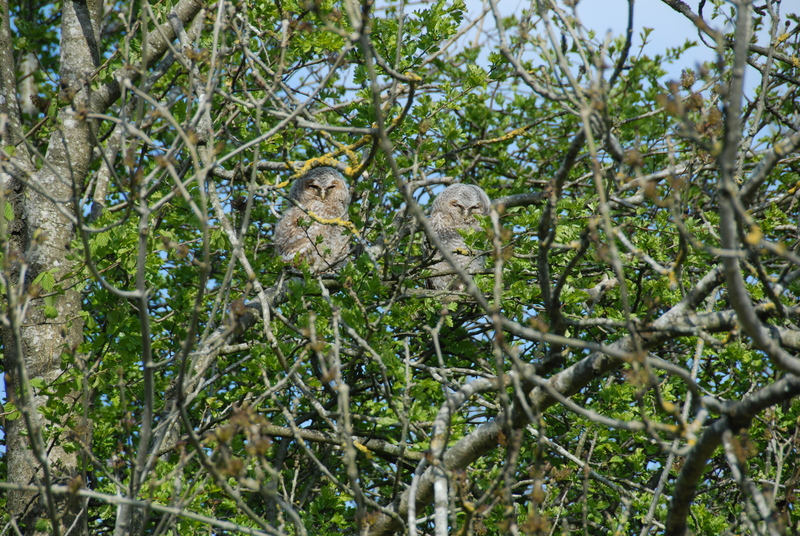 After ten days or so of fascinating owl watching, we had to go away for a short holiday and after we got back they had gone. A few days later we could hear them calling across the valley and in nearby trees but we didn’t see them clearly for a few weeks. 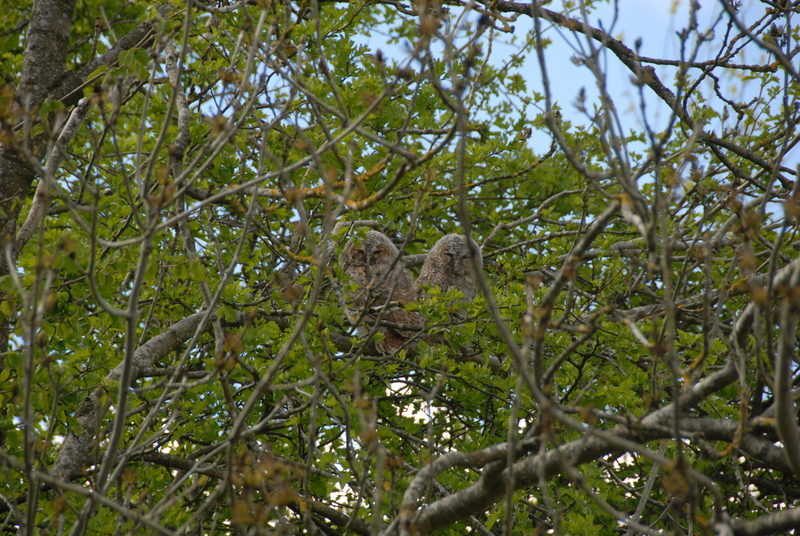 Then one morning I saw three owls fly from the beech tree at the bottom of the garden. Since then they we have seen them several times, including close sightings on the garden fence and barn roof late at night. 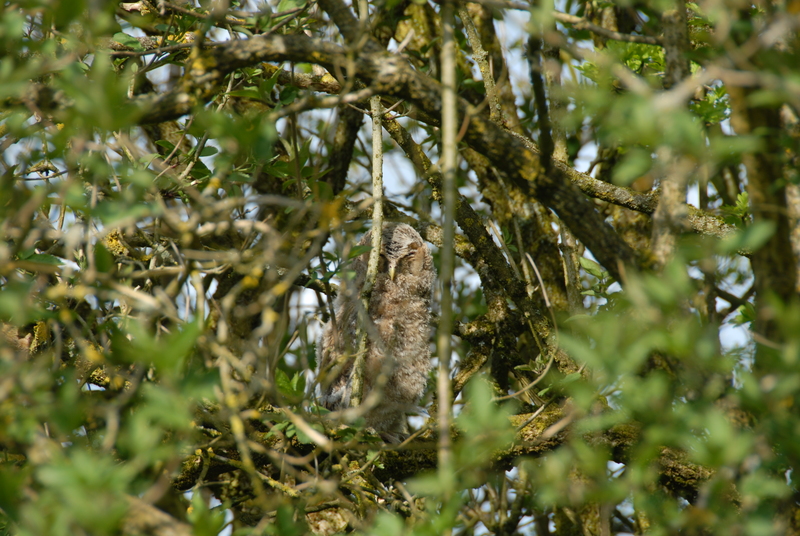 After a couple of days without a clear sighting, we found not just one but two owlets, together in a tall hazel just outside the garden. It seemed like there might be two but we couldn’t be certain until we saw them together. At first they were some distance apart but later we found them huddled together. 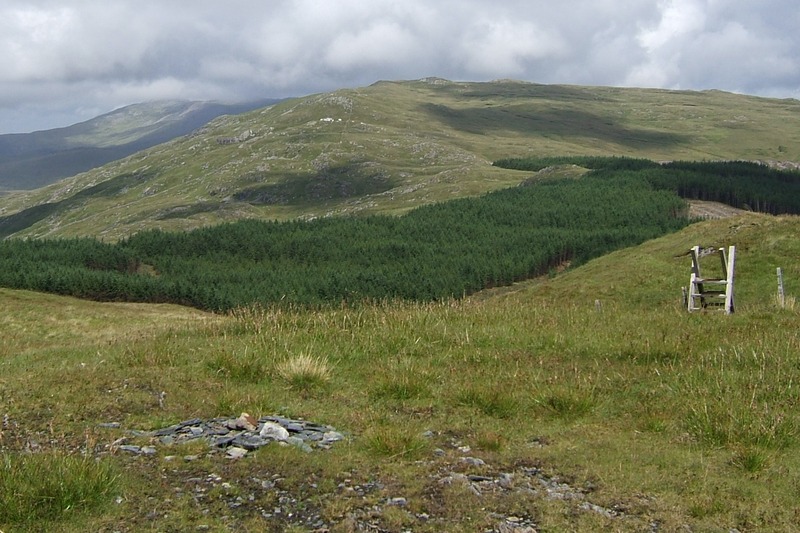 Over the following days they moved around the same groups of small trees – with the adults also going back and forward between them and the other groups of trees across the valley. When I first found the owlet on the bench we worried because he didn’t move for a couple of hours – but this is obviously how they protect themselves. They just stay more or less in the same place, at least during the day, and the adults check on them periodically and presumably feed them as well. Each morning it was a case of checkin g if they were both there. They are quite distinct: one is significantly bigger and seemed to have more adult feathers showing, the other looks like Uncle Fester in the Adam ‘s Family- both had grown a lot in just a week! After walking the dogs fi rst thing, I saw Izzy, the spaniel, barking at something on the bench near the back door. 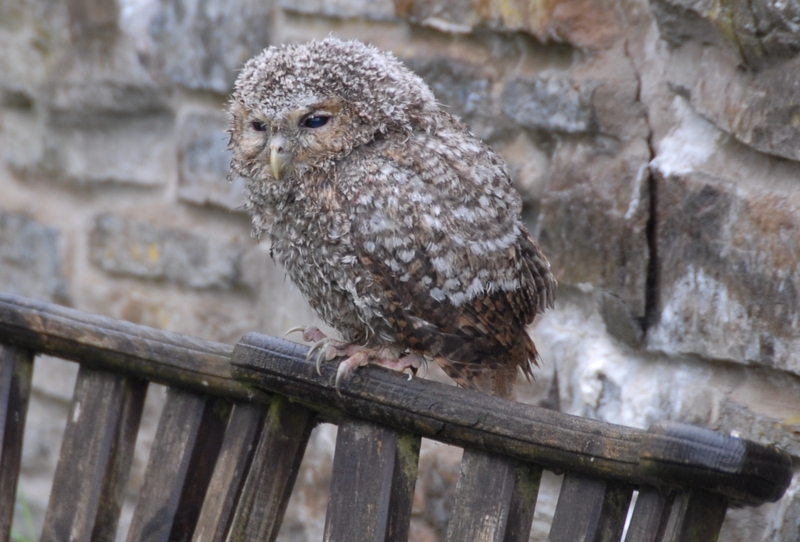 When I got there I found a young owl hunched up on the back of the seat – totally motionless and looking rather bedraggled. It stayed there most of the morning, before eventually scampering (flying is not the right word) across the garden to the bushes running down the side of the garden. 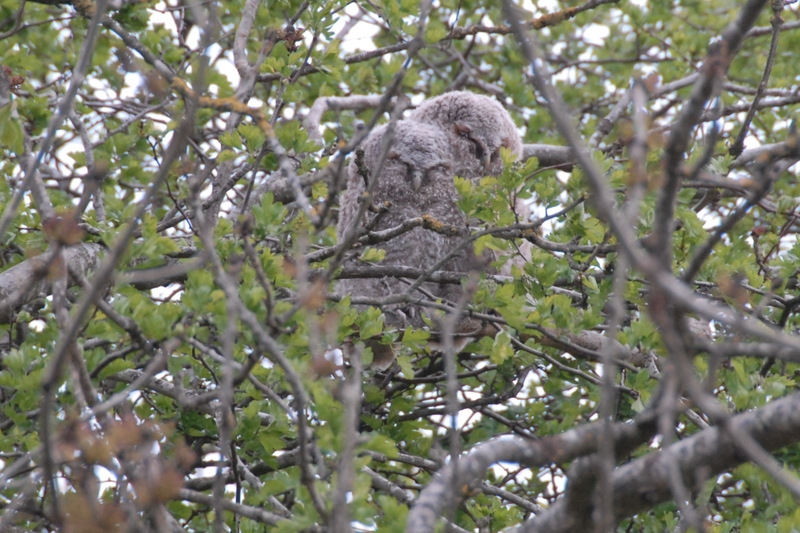 Later that that evening, we watched through binoculars as he sat in the trees at the end of the garden, while one of the adults flew back and forth around him, calling as well. 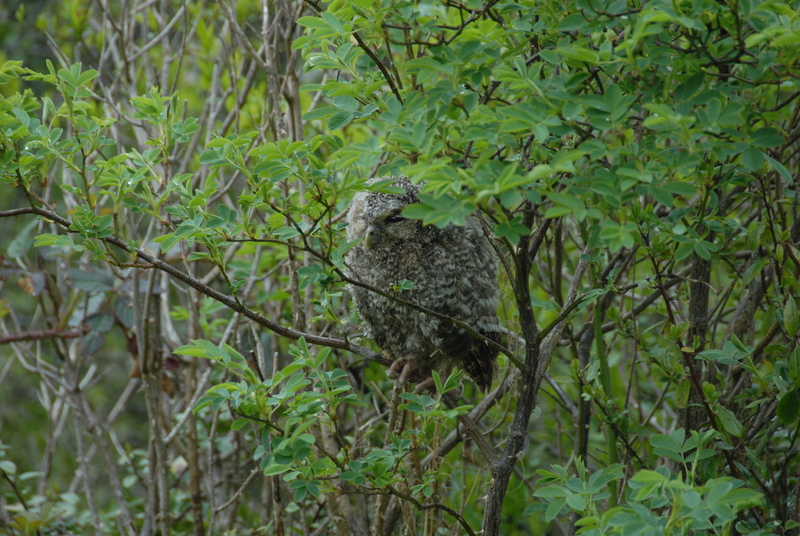 The next morning he had moved slightly into a large hazel tree a bit below our fence.